Women & Philanthropy at The University of Toledo is partnering with the Judith Herb College of Education to help provide books to 40 second-grade classrooms in the Toledo Public Schools. Last year, the organization’s Holiday Project raised enough funds to donate 1,000 books to 33 second-grade classrooms in 19 of the 40 TPS elementary schools. 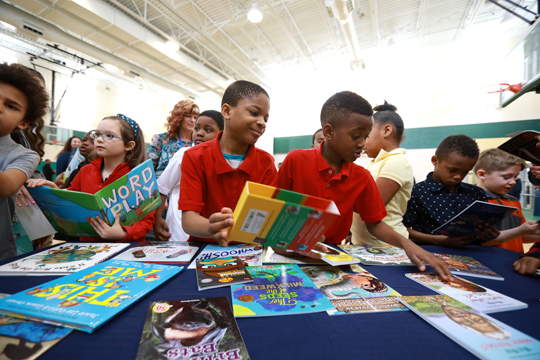 Second-graders at Old Orchard Elementary School checked out some of the books donated to Toledo Public Schools by UT’s Women & Philanthropy and the Judith Herb College of Education. The books were distributed to 33 second-grade classrooms at 19 TPS schools March 15 during a ceremony at Old Orchard Elementary. Women & Philanthropy is getting an early start on this year’s project and is accepting donations through Tuesday, July 31. With the help of donations from the community, Women & Philanthropy hopes to provide $200 worth of books to the second-grade classrooms in the remaining 21 TPS elementary schools before the academic year starts. In order to do so, $8,000 in donations will be needed. The Holiday Project is also accepting good-as-new used children’s books at second- and third-grade reading levels. New or gently used books may be dropped off to Metzger in Driscoll Alumni Center Room 2014A. This entry was posted on Thursday, June 21st, 2018 at 3:37 am and is filed under Advancement, Events, UToday .